Deciding which fuse to use as a replacement for a blown fuse is usually a simple matter - read the part number or electrical parameters (current, voltage) off the package and make sure of its type (fast or slow blow). Of course whenever a fuse blows, you usually have more or a problem than just a bad fuse. Deciding which fuse to use when designing a circuit which requires overcurrent protection requires a lot more consideration. This article from fuse making company Bussmann's Charles James gives a brief introduction to the kinds of parameters you need to factor into a selection. There's more to it in most cases - especially for a shippable product - than measuring the current under normal operating conditions and then adding some arbitrary buffer like 20%. Extreme ambient temperature requires derating, mechanical conditions during operation like high vibration or impact, time delay for more than a short-lived transient event, available space for mounting, whether to make it easily replaceable or soldered in, etc., requires careful study. Types of fuses and where they are used. How to select the right fuse for your circuit. Bussmann Mfg. Div., McGraw-Edison Co. Fig. 1 - Operating characteristics of three fuse types described in text. From a strictly mechanical point of view, fuses may be placed into two general categories. The first category is the "clip-in" fuse, which must be placed into some kind of fuseholder or a pair of clips to perform its normal function. The other category includes those fuses that have leads soldered to the end-caps and are generally referred to as "pigtail" fuses. Pigtail fuses can be soldered directly into an electronic circuit or printed circuit board, without a fuse-holding device. Time-Delay Fuses. One of the most popular fuses in use is the so-called "time delay" fuse (sometimes referred to as "slow-blow"). This is a general-purpose fuse with the ability to pass harmless transient currents and yet blow with sustained overloads or short circuits. It is usually constructed with a solder-alloy heat sink that can dissipate the heat generated by momentary transient currents and is spring operated when the current lasts long enough to cause the solder alloy to melt. This type of fuse is sensitive to ambient temperature and must be de-rated when applied in an extremely warm location in order to carry the load current. Fast-Acting Fuses. Another very popular fuse is the "Fast-acting" (or "normal blow") fuse. This is usually applied in circuits where there are no transient or surge currents to hamper its operation. This fuse generally has a single-element, wire link construction, without any heat sinks to absorb momentary overcurrents. Fast-acting fuses thus blow very quickly on overloads and must be applied very carefully with regard to the amount of full load current. Quite frequently these fuses are used to provide short-circuit protection only and, therefore can be sized at approximately 250-300% of the full load current. Ambient temperature has very little affect on the performance of these fuses. "Very fast-acting" fuses are becoming increasingly popular for use in circuits that require extremely fast operation to protect critical components, such as meters or semiconductor rectifiers. Electronic equipment that has very little ability to withstand over currents requires this kind of protection. This fuse is constructed similarly to the "fast-acting" fuse except that the link is usually surrounded by a special filler material and the fuse body is made of ceramic or phenolic material. The very fast-acting fuse is essentially insensitive to ambient temperature. Comparing Fuse Characteristics. Figure 1 shows the operating characteristics of the three types of fuses mentioned above. Consider that all three types carry a one-ampere full load rating but, as can be observed, the blowing time for each is considerably different for a given overload current. For example, when the overcurrent is 200% (2 amperes), the time-delay fuse takes 18 seconds to blow while the fast-acting fuse opens in approximately 1.4 seconds. A 2-ampere current, through a very fast-acting one-ampere fuse, causes the fuse to blow in 0.13 second. 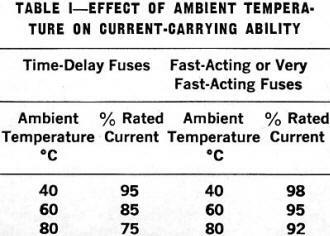 Table I - Effect of Ambient Temperature on Current-Carrying Ability. It can be seen from the above that a knowledge of the circuit in which a fuse is applied is important. Will the circuit develop transient currents? How fast must the fuse operate when a short occurs? These and many other questions should be considered when initial circuit design is undertaken. There are many fuses today which have been developed to meet special needs. Usually, the fuse dimensions or physical construction have been altered so that a special mounting means can be employed or so that an indicator can be built into the fuse to signal when it has blown. These fuses have particular applications and are not considered to be general-purpose fuses. The fuses covered here are general-purpose types readily available on the market. Criteria for Selecting Fuses. There are many considerations that should be given to fuse selection. Voltage and current ratings are the two most popular (often the only) parameters that are investigated when selecting a fuse. Other criteria that must be examined include short-circuit current rating, fuse characteristics, application temperature, fuseholders and mechanical dimensions of the fuse. Voltage Rating. Select a fuse with a voltage rating equal to or greater than the voltage of the circuit. The standard fuse voltage ratings which are available for electronic fuses are 32, 125, and 250 volts. Keep in mind that a fuse with a higher voltage rating can always be used on a lower voltage circuit. For example: a 250-volt fuse can be used in a 125-volt circuit. The reverse procedure, however, can be very dangerous and should always be avoided. All 125- and 250-volt fuses have the voltage rating stamped on the end caps. If there is no voltage rating stamped on the cap, then it should be considered to be a 32-volt fuse unless reference to its symbol can be made elsewhere. Automotive circuits use 32-volt fuses, while 125-volt fuses are often applied in the input circuit of power supplies. Fuses rated at 250 volts, for example, may be applied in the B+ circuit of a TV receiver. Current Rating. Once the voltage rating is determined, a fuse with an ampere rating greater than the expected circuit full load current should be selected. The generally accepted procedure is to choose a rating about 25% greater than the full-load current of the circuit, because fuses are built to carry their rated current in open air at room ambient; whereas they are usually applied in some type of enclosure and the enclosure temperature is often higher than room ambient. 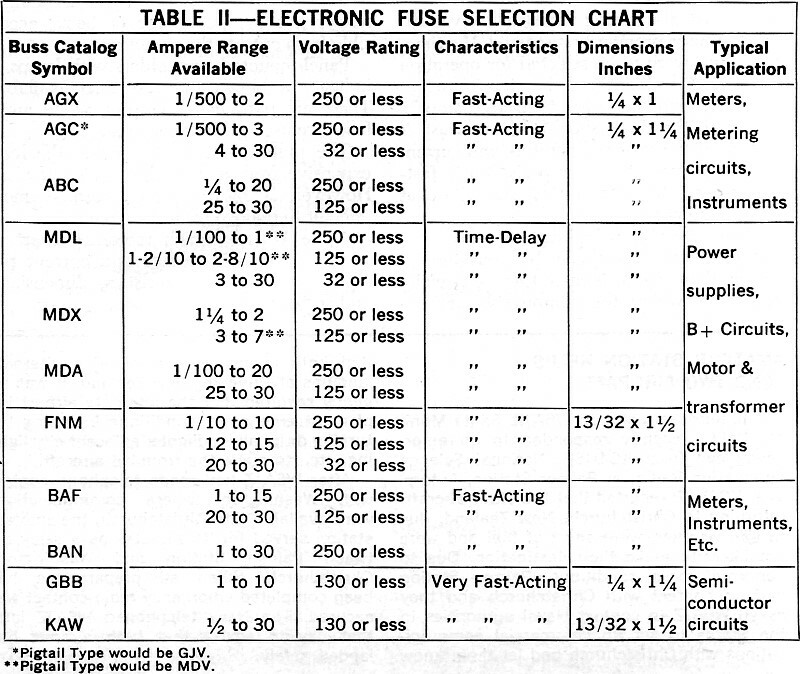 Table II - Electronic Fuse Selection Chart. An important point to remember is that the voltage rating described above does not in any way affect the ampere rating. A one-ampere, 125-volt fuse and a one-ampere 250-volt fuses have identical current-carrying capacities. Only the ability of the fuse to open a short-circuit current is affected by its voltage rating. Another frequent mistake made in selecting the ampere rating of a fuse concerns the current waveshape. Many electronic circuits have unusual waveshapes, such as those in rectifier circuits. The object of a rectifier circuit is to produce a dc voltage from an ac source; thus, the normal thought would be to select a fuse for the de circuit on the basis of the dc current that is flowing. This would be acceptable if the rectified wave were perfect; however, we know that in practical circuits, we do not need a perfect dc current and it is difficult to produce. Since the dc wave is not perfect, there is an rms value of that wave which, in many cases, exceeds the dc current value. Consequently, the fuse must be selected for the rms value. An example of this is the case of a simple half-wave rectifier with a one-ampere dc output and an rms value of the wave shape of 1.57 amperes. The general rule to follow is to select a current rating based on the rms value of the current. Only when the rms value equals the dc value is it acceptable to pick the fuse size based on dc current. Short-Circuit Current Rating. Should a severe short circuit occur in an electronic circuit, it is mandatory from a safety standpoint that the fuse clear the fault without rupturing. It is for this reason that fuses are given a short-circuit rating that goes along with their voltage rating and must never be exceeded. A normal 125-volt circuit load current could be two amperes full load but, when a short occurs in the circuit wiring, the current might increase to 1000 or 2000 amperes. The fuse, in turn, must be able to open the circuit safely under this condition. Generally, short-circuit currents with magnitudes in the thousands of amperes are the exception rather than the rule in the case of low-energy electronic equipment. For most electronic devices, if a fuse of the proper voltage rating is selected, it will have an adequate short-circuit rating. Temperature. How many times have you checked a troublesome circuit and found that the current was less than the fuse rating? Did you happen to check the temperature to which the fuse was being subjected as well? The effect of ambient temperature on fuse performance can be appreciable, especially where time-delay fuses are involved. 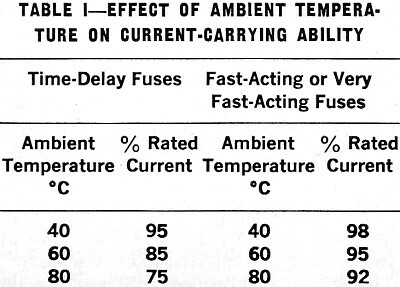 Table I shows the effect of temperature on the current-carrying ability of the various types of fuses previously discussed. If a time-delay fuse were to be selected for operation in an 80°C ambient and the circuit current were 375 milliamperes, then the ampere rating of the fuse should be at least 1/2 ampere. If the same temperature and current conditions were to be imposed on a fast-acting fuse, the fuse rating should be at least 4/10 ampere. There are many applications where operating temperatures can be considerably higher than room temperature, especially in circuits where the components are enclosed by a cabinet or case, as in radios, TV's, power supplies, and amplifiers. 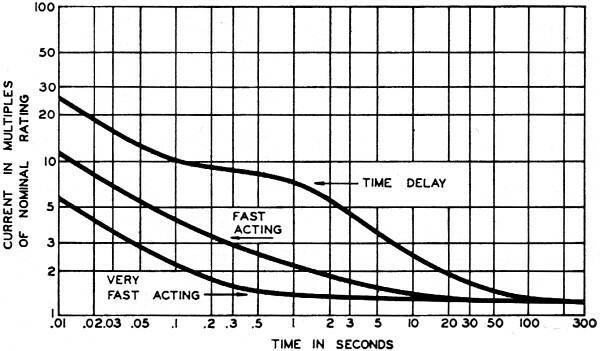 Time-Current Characteristic. Once the voltage and current ratings are decided upon, a major consideration is the time-current characteristic of the fuse. 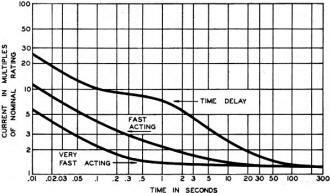 The circuit determines to a great extent whether a time-delay, fast-acting, or very fast-acting fuse is the correct choice. If harmless transient currents might occur, a time-delay fuse would be needed. If the circuit is a bridge rectifier, a very fast-acting fuse would be recommended. Dimensions. Fuse dimensions are usually considered in initial design and can be critical when space is a factor. The most common electronic fuse dimensions are 1/4" x 1", 1/4" x 1 1/4" and 13/32" x 1 1/2". A wide variety of mountings with a number of special features (if desired) are made for these fuse sizes. Fuseholders. The most popular fuseholder for mounting on a chassis inside an enclosure is the ordinary Bakelite (phenolic) fuseblock which has fuse clips and wire terminals attached. For mounting the fuse in an enclosure or panel, the "panel-mounted fuseholder" is extensively used. This fuse-holder has the advantage of being accessible from outside the enclosure. Panel-mounted fuseholders with lamps to indicate a blown fuse are also available. 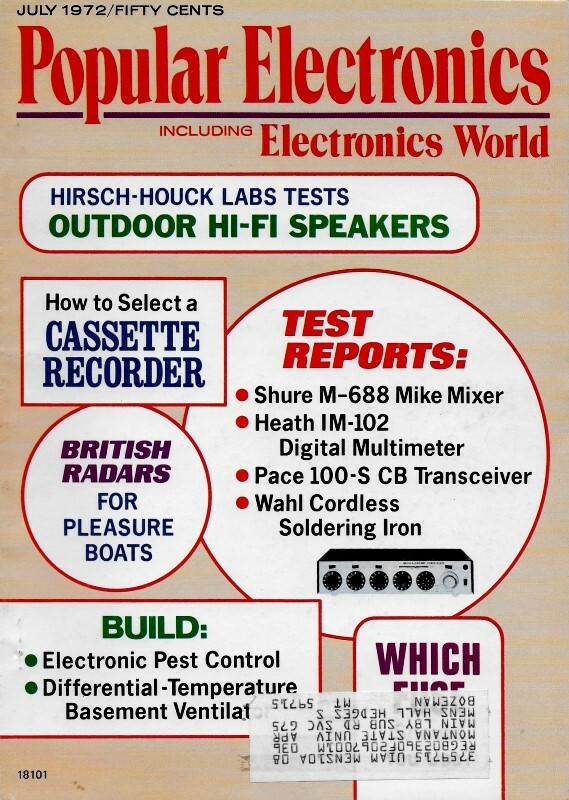 These are particularly helpful where many fuses are used in the same area. The pigtail fuse is, of course, the least expensive from a fuseholder point of view. However, a blown pigtail fuse is more difficult to remove from the circuit. 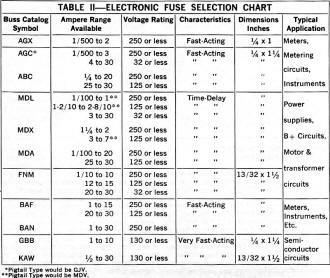 Table II is a quick reference chart of fuses giving their voltage and current ratings, operating characteristics, dimensions, and some typical applications.